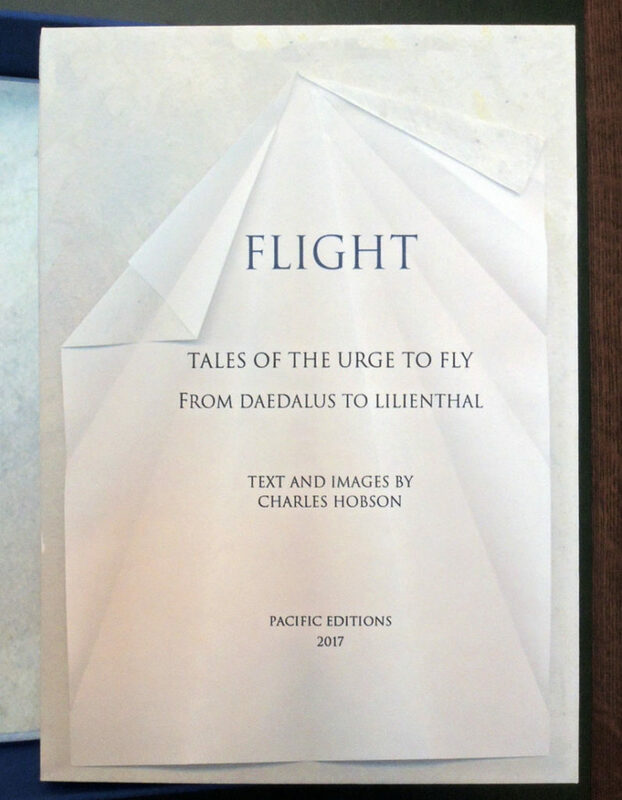 Charles Hobson, Flight: Tales of the Urge to Fly from Daedalus to Lilienthal (San Francisco: Pacific Editions, 2017). Contents: Daedalus’s Golden Eagle — Leonardo’s Bat — Cayley’s Red Kite — Le Bris’s Albatross — Lilienthal’s Stork. Copy 21 of 30. Graphic Arts collection GAX 2017- in process. 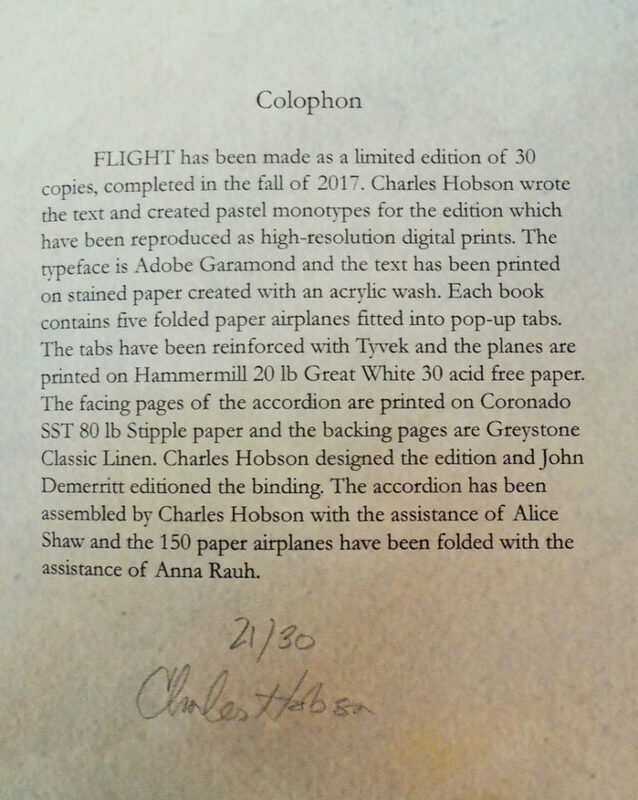 “FLIGHT has been made as a limited edition of 30 copies, completed in the fall of 2017. Charles Hobson wrote the text and created pastel monotypes for the edition which have been reproduced as high-resolution digital prints. 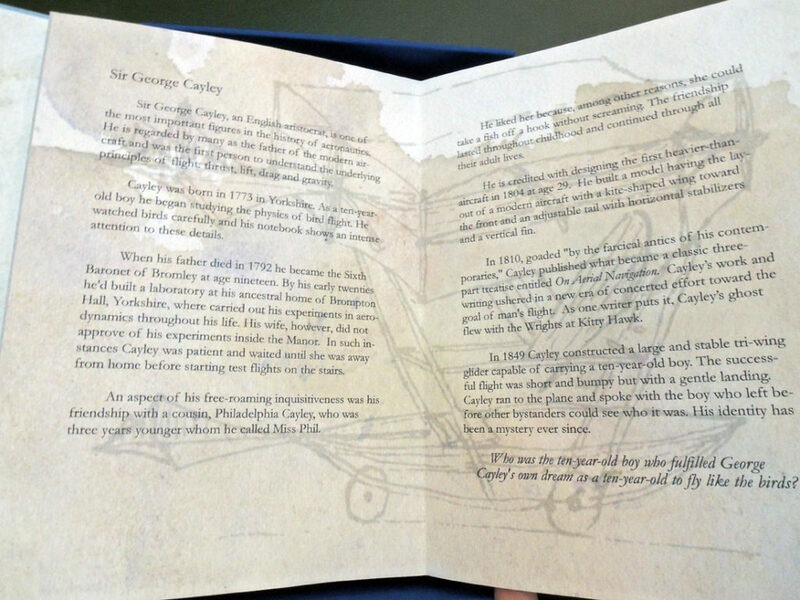 The typeface is Adobe Garamond and the text has been printed on stained paper created with an acrylic wash. Each book contains five folded paper airplanes fitted into pop-up tabs. The tabs have been reinforced with Tyvek and the planes are printed on Hammermill 20 lb Great White 30 acid free paper. 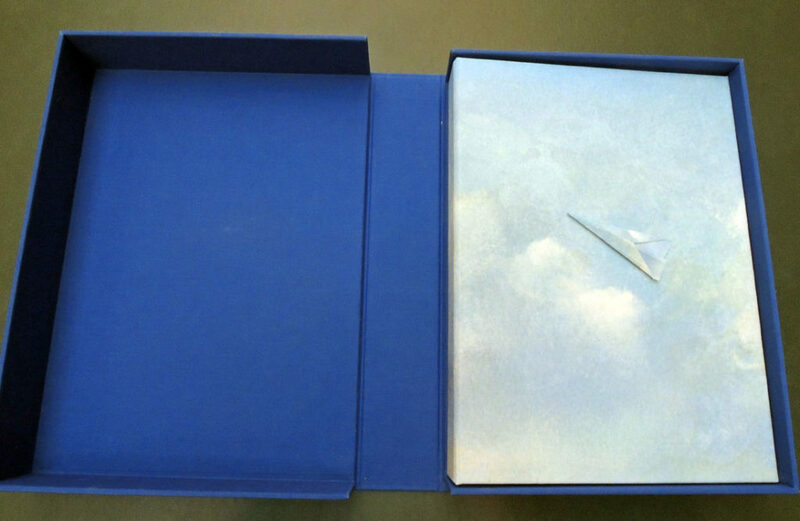 The facing pages of the accordion are printed on Coronado SST 80 lb Stipple paper and the backing pages are Greystone Classic Linen. 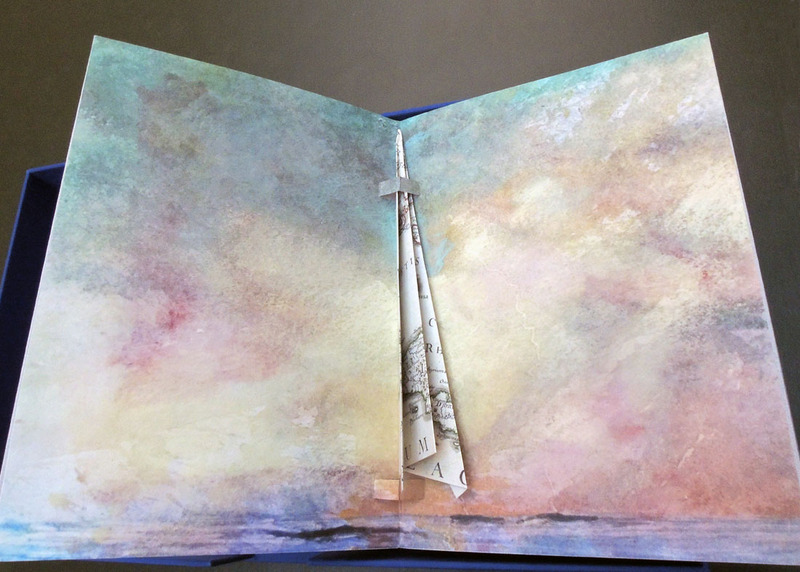 Charles Hobson designed the edition and John Dermerritt editioned the binding. The accordion has been assembled by Charles Hobson with the assistance of Alice Shaw and the 150 paper airplanes have been folded with the assistance of Anna Raugh.”–Colophon. 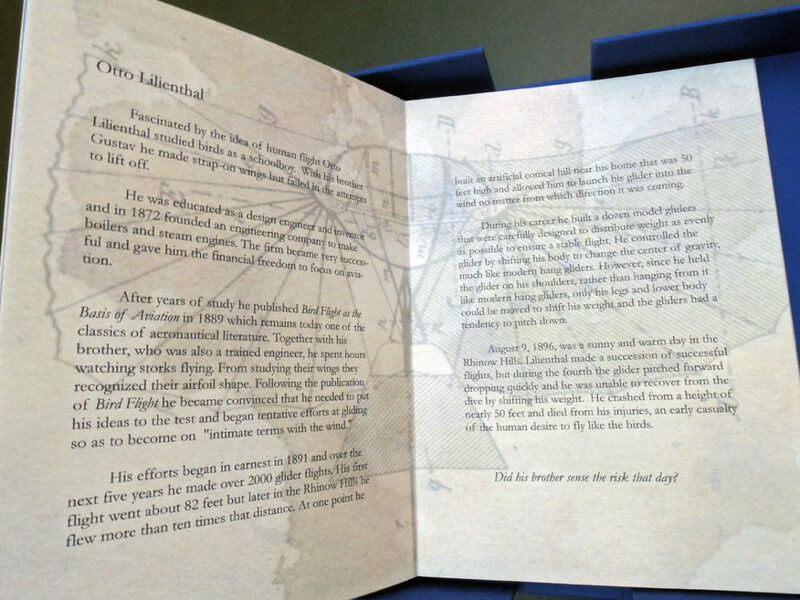 Five fictional messages are found inside the paper airplanes, including one each from Daedalus, Leonardo da Vinci (1452-1519), George Cayley (1773-1857), Jean-Marie Le Bris (1817-1872), and Otto Lilienthal (1848-1896). “What bird did they watch? As would be expected each aspiring aviator was transfixed by the flight of a bird. The bird in each case, was different. In the following pages the bird that captivated the man is pictured and the details about its species have been described.”–Page  of the facing pages of the accordion. 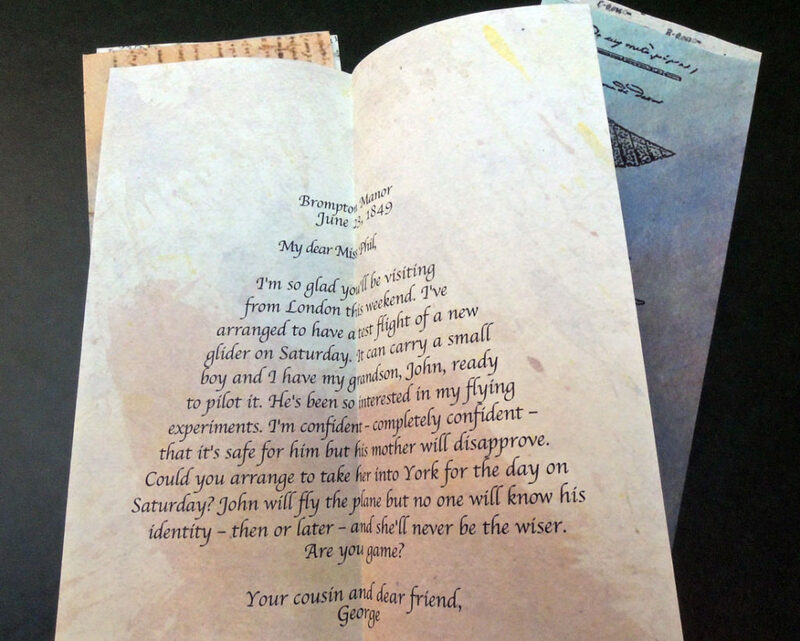 This entry was posted in Acquisitions, Artists' books on December 8, 2017 by Julie Mellby.